Now that NASA knew how to land accurately on the Moon, it could pursue its science goals with increased vigour with a view to finding out how the Moon formed, though whether the tax-paying American wanted to know this information is a moot point. Lunar studies before Apollo had focused upon one large feature as perhaps being a key to understanding much of the visible lunar landscape. This was Mare Imbrium, one of the lunar 'seas' that was readily visible. In reality, it is a massive 1,300-kilometre structure created when an asteroid hit the Moon in the distant past and later filled with dark lava. Like any impact structure, the Imbrium Basin would have been surrounded by a blanket of material ejected during its formation. The cadre of lunar scientists involved in Apollo believed that much could be learned by sampling this ejecta blanket, which appeared to dominate the near side. To sample it, they proposed a landing site for Apollo 13 in hummocky terrain just north of the crater Fra Mauro. Apollo 13 started to run into problems a few days before its 11 April 1970 launch when the command module pilot, Ken Mattingly, was replaced by his backup, Jack Swigert, after a possible exposure to rubella. The glitches continued soon after launch when one of the five engines in the second stage of the Saturn V shut down prematurely. However, these issues were as nothing to what happened 328,300 kilometres from Earth and 90 per cent of the way to the Moon. Almost 56 hours into the mission, as Swigert, in response to a request from mission control, operated a fan to stir the contents of an oxygen tank, the tank violently burst. The resultant shock blew out one of the skin panels of Odyssey's service module and damaged enough of its oxygen system to leak most of the spacecraft's supplies of the vital gas out to space. This traumatic event deprived the spacecraft of electrical power and began a four-day feat of dedication, ingenuity and endurance by the crew, the flight control team and thousands of support staff to effect a safe return to Earth despite a catalogue of complications resulting from the damage to their ship. 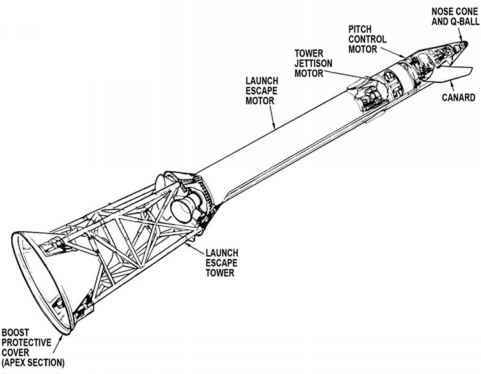 Every system in the SM was rendered inoperable, from the blast itself, from lack of power, or from the engineers' fear of using systems that may have been damaged. The CM had to be powered down very quickly to save its remaining consumables as they would be needed for the reentry into Earth's atmosphere. This left the unused LM Aquarius as the only way the crew could sustain themselves while the two joined ships swung around the Moon and headed for Earth. It also became the sole means of propulsion when engine firings were required to speed their return and control the accuracy of their arrival. ingly exhausted as they took refuge in ^JPMyR^K, i the LM while they nursed their dead "
to to remove toxic carbon dioxide from their air, Apollo m shattered service module. work their way through complex checklists to fire the LM's main engine, and also control it for the correct duration while ensuring that it was correctly pointed. They found themselves carrying out difficult and often unpractised procedures without having slept for days. 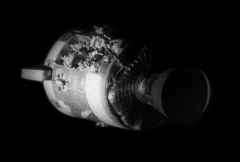 In the flight's final moments on 17 April as it re-entered Earth's atmosphere, the world was gripped by the tension of not knowing whether Odyssey's heatshield had been damaged by the blast. A safe splashdown in the Pacific Ocean ended a failed mission that became perhaps the finest hour for a spacecraft's crew, its ground control team and the supporting organisations behind them. It showed that in spaceflight, and in the face of terrible odds, toughness and competence could yield success. 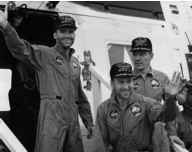 The exhausted crew of Apollo 13 after might not have had a LM available to act as a their recovery from the Pacific Ocean. lifeboat. A case of lucky 13.